← Are You a Pig, Owl, Beaver, or Clam? It’s summertime! Lots of students on summer vacation are flocking to (going to in large numbers) movie theaters. Students today may be surprised to learn how popular Westerns were before the 1970s. They may be more surprised to learn that some of the most famous classic (well-known and respected) Westerns weren’t even filmed in the U.S.
A Western is a movie about the Western part of the United States during the 1800s, when there were a lot of cowboys (men who ride horses and move cattle (cows) from one place to another), Indians (now called “Native Americans” or “American Indians”), and ranchers (people who owned many cattle). Many Spaghetti Westerns were filmed (recorded) in the Spanish desert (a hot, dry, sandy area) because it looked similar to parts of the American West. Also, because Spaniards spoke Spanish, it was easy to find Spanish-speaking actors to act as Mexicans, usually fighting against the American cowboys. Spaghetti Westerns were very violent, with a lot of fighting. They were also filmed in a minimalist (simple) style, and many people did not like these movies for that reason. But in the 1980s people began to appreciate (see as being good or worthwhile) Spaghetti Westerns because they realized how influential (having a lot of impact) they were in shaping (causing to change) Americans’ views of the American West. Three of the most famous Spaghetti Westerns are those in the trilogy (a series of three related movies) called “Man With No Name,” directed by the Italian director Sergio Leone. 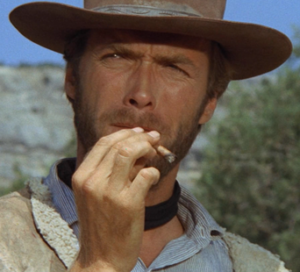 Before Clint Eastwood became an Academy Award winning director, he was a very popular star (main character) in 1960s Westerns, including in this trilogy. The three movies in the trilogy are “A Fistful of Dollars,” “For a Few Dollars More,” and “The Good, the Bad and the Ugly.” The third movie — “The Good, the Bad, and the Ugly” — is probably still one of the most famous Westerns ever made. * This post was adapted from “What Insiders Know” from Cultural English 80. To see the rest of the Learning Guide, including a Glossary, Sample Sentences, Comprehension Questions, a Complete Transcript of the entire lesson and more, become a Select English Member. This entry was posted in Television and Movies. Bookmark the permalink. My favourite of the trilogy is For a Few Dollars More, especially its soundtrack. By the way, the title of this film in Spanish would be “the death has a prize” which, this time, I appreciate more than in the original language. Let me tell you something that happened to me recently. I had to call a locksmith and when i was telling him my problem, his phone rung with this movie ringtone. It sounded to me so nice, that I instantly guess that he would do a good work. What it finally was true: I am now very happy with my new lock. You know, some kind of irrational. I used to watch spaghetti Western as a child. I was obsessed with them in my adolescence time. There is an air about him. The role he plays in western movies is totally Him. I watched them so many times that I totally lip syn the lines with the characters. I watched gun slinger Western movies copiously in my teen and post teen years. I felt like it is where I really belong. I dare to say I almost watched all the sphalerite westerns movies out ther, all the famous ones at least. I usually go it alone. Meaning ,I go to the movies all by myself. Given I m a movie goer, it has turned to this lonley experience. Honest, I prefer watching movies with s bunch male friends that gal pals. I don’t know wether it is just me or women tend to get chatty watching movies. Well ,according to my experience ,every time I went to the movies with a date,I ,half the movie in, I wanted to turn a gun on myself. I akways ended up retaking the movie. They keep calling me on that. I mean they keep saying I get all boondoggle. Guess what I m off today. Well , I called in sick as I have a frog in my throat. Might as well ,I can’t bank them on anyway. U see what I m saying ? The problem is ,Compony has a zero tolerance about it. I mean , There are hard and fast rules about it. Staffers get 12 sick days per year spreading all over the year. Meaning ,Employees don’t get to string them together and get an straight 12 days off. There is no roll over policy attached to it either. We ,the staff, don’t get to accumulate sick days till the end of work year cycle. I mean ,we can but if we do we will losses them. It is not like they will be rolled over on to the next year. The company has a very strict policy about it. I m telling you. Should u bend the rule there , u will be reprimanded for the breach severely. Anyway ,it is not the point. Skimming the post the other day, I was intrigued!! I mean , it prompted me to rewatch the trilogy once more through all hours of the night last nigh. They get me every time. So this morning I was all disoriented ,drowsy and grouchy. I m getting some caffeine in me as we speak. I could barely keep my eyes open and the star bucks app on my phone was acting up. I loaded 10 dollars in the app yesterday. I m standing in line -feeling half sleep -waiting for my turn to get a tall pike. I get up to the head of the line. Sometimes I think the star bucks app has a life of its own. Things you do for a fresh dose of caffeine. Plus ,The wise cracks ,being smart and everything make the 2/3 hour runtime of the movies feel like a bout. Sorry for my obsession with this post. The thing is it totally took me back. Even all-around douch charctors “the outlaws ” are lovable characters in the western spaghetie movie. My impression all along was they are all shot in mexic or sth. Almería, Peter. It’s a part of Andalucía, on the South-East of Spain. Wistling, wistling. There is a Spanish man called Curro (Francisco) Savoy, who became very popular wistling songs. In the USA, he changed his name as Kurt Savoy.He also performed the songs of those Spaghetti Westerns, although he wasn’t the original wistler. I’ve seen him in a video and it’s amazing the way he does it, because he lets the air go between his teeth! It sounds so fine..
I’ve said Spanish man, but i should have said Spanish musician. It’s more appropiate. Whistle is spelled with h. A recurrent mistake of mine, it’s my fault. Once I heard that in a French speaking country – I don’t remember now which is – it is considered a jinx whistling inside a building. A funny superstition, isn’t it? As far as I m concerned , back in the golden era of Hollywood Casting directors factor in rather put some emphasize on the way actors look. And I heard, singing voice was a petemeter too. U know back then, in 50s, 60s,and 70s the majority of actors were beautiful ,good looking. Clint Eastwood is a living prof of it. I can line up the name of dozens of beautiful ,hot actors from back then.